It may sound paradoxical, but I am convinced that without the Internet we would have none of the collective hyperproduction of nostalgia that has been evident for some time. By saying this, I do not mean to spout a cliché about the psychology of the Internet, ie the lack of synchronism between the immediacy of information and interior time, the instantaneous contraction of communication and the physiology of human processing. I believe that this is now a given that we can use as a new starting point, a new configuration of the individual reactivity to which art is offering a new opportunity to break the rules. The point is, however, not to proffer arguments for the umpteenth and latest version of pre-technological Arcadia. The Internet is today’s biggest producer of nostalgia, because it is the place of perennial research, composed of immediate yet obsolete results, rejects and sudden insights. It is the immense archive of a historiography made up of recent ruins and the minimal rejects of the present; errors and imagination. It is the space of desire that anticipates its subject and surpasses it, the place of protracted hope, replacement and the memory of something that has not ended yet, but is already a pop relic. Above all, the Internet is the time of minor daily shocks and their immediate recomposition, the instant of domestic passion and its repetition until it becomes threadbare, the moment of the fragment that is always willing to be reactivated, of the episodic, of expectation and of a horizon that can constantly be shifted. Most of us spend our days merging the search for lost information with the pursuit of possible romances, weaving a daily elegy of solitude and opportunism, fear and partiality. We bear the burden of a not-so-distant past, as we await continual reconstitution. The Internet is not a place of spectres merely because one can hide there behind a fake identity, but because it forgets nothing. Victor Man is an artist who has seemingly made the past and nostalgia his field of action. Yet I am convinced that things are not nearly as simple as they may appear, despite the fact that his career as a Romanian artist – who grew up on the verge of the demise of the Communist regime, studied in Israel and then resettled in his native Cluj-Napoca—seems to back this idea. 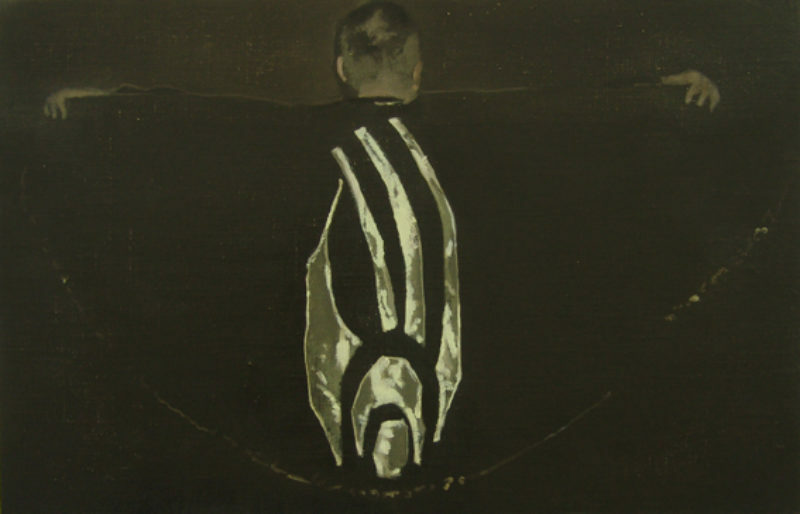 Because, in short, his work encompasses every topical element: the use of existing images, a painting style featuring dusty, thick hues as dull as a blurred memory, the repeated use of ambiguous and often traumatic iconographies, the penchant for distributing in space the scattered elements of a narrative composed of pauses and false, fragmented clues. Yet Man does not use memory for consolatory purposes: his is not a gentle world offering succour. His language is ostensibly laconic. Most of his paintings are small; his sculptures are the outcome of a very simple juxtaposition of elements that have been found and, for the most part, exhibited in their entirety. A few other spurious things (photographs, sketches, texts, objects) are combined in small compositions within a space that is otherwise left empty. The images in the paintings clearly betray their mass-media origins and the fact that they pertain to an essentially unidentified elsewhere of reproducibility (books, cinema, magazines, the Internet). Nevertheless, the broader and more complex installations in which they are set muddy the waters, because the way in which they are associated with each other in delicate and fragmented compositions is not linear by any means. 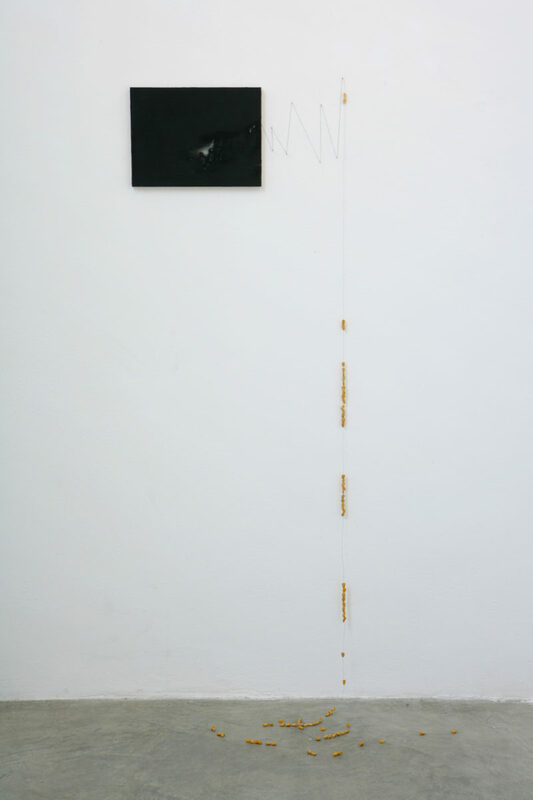 In his contribution to the Romanian Pavilion at the current Venice Biennale, for example, the artist responded to the suggestion of the curator, Mihnea Mircan, to ponder the idea of ‘low-budget monuments’ by creating a series of works that start with the building’s façade and culminate inside. 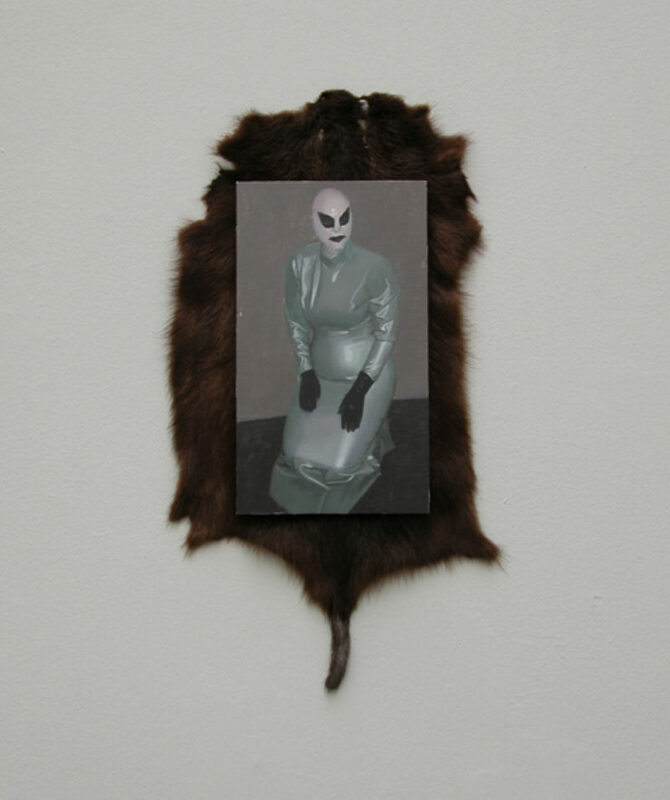 On the stone exterior of the building, the empty spaces between the letters in the word ‘Romania’ are filled with scraps of fur—a Beuysian gesture of protection and isolation—whereas inside the exhibition space a group of children dressed in animal costumes populates a large dark painting, dominating an assemblage of objects and other small paintings. 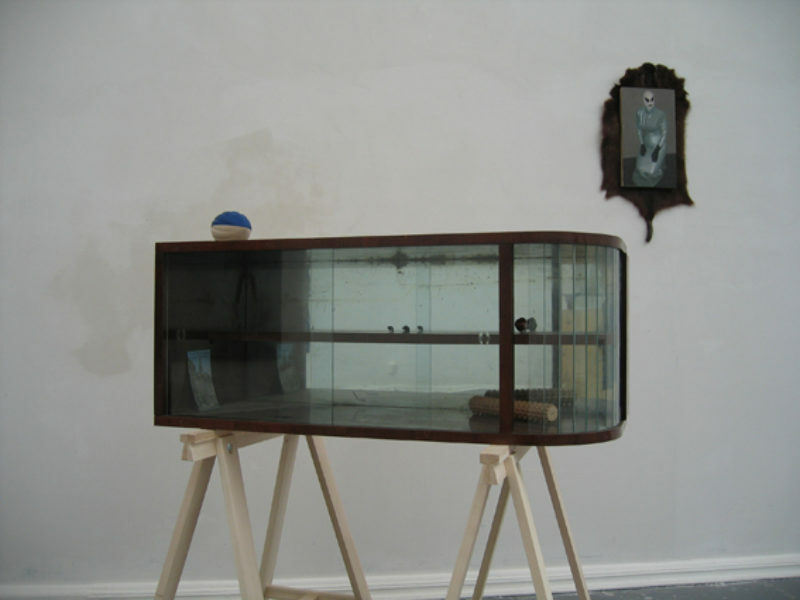 A porcelain knick-knack of a dog, plaques reproducing frames from Murnau’s Nosferatu, a pair of small compositions with a vaguely Constructivist air, the image of a latex-clad body and a face completely disguised by a mask, an empty old glass cabinet with a few remnants of a past life: Man’s work is a solemn choreography punctuated by nationalistic rhetoric, ambiguity and abandonment. It is the funerary articulation of memory, in which ethnic stereotypes and cinematographic and poetic clichés have been blended with the tenderness of personal remembrance, abstraction and the poor taste of discarded furniture. The entire installation is effectively a subtle paean to life that abandons the forms and guises of the inorganic to perpetuate existence: the dead animal transformed into a garment and the artificial image of pets, animals with a human mind, the leading characters of fairytales incarnated in children’s costumes and games, the body concealed and hypersexualised by latex, disguises and the utmost synthesis of formalisation in abstract painting. Man’s oeuvre is distinguished by the displacement of elements that have been borrowed and re-narrativised in order to reconstitute what seems to be a mutilated conscience—even when his installations are imbued with a very different and less macabre atmosphere than in Venice. In any case, when the artist uses images and objects found on the Internet or around him, what he always seems to suggest is the fact that the past cannot be reduced to a coherent unit. Because the past—public or private—can be the subject of analysis and compromise, it can be digested through revenge or oblivion, but it can never fully be ‘understood’. It always remains a disjointed and shapeless thing, a foreign and incoherent object mumbling the same memory. This is why Man’s art follows a dual track in its rapport with images. He himself observes that ‘the ideas come after the images have already been found and selected for the particular visual excitement they arouse’. At the same time, the way in which they are combined—as assemblages of paintings alone or of paintings and objects—recounts a life that has nothing to do with those images. He articulates a narrative that cannot fully take into account the past that the images themselves have survived and that, in a certain sense, they generated in the first place. To some extent, the fragile architectures that Man composes, starting with his paintings, are an attempt to restore the memory of a perception that has lost its object, an attempt pursued by stripping away the original narrative to which those figures belong. In this sense, his work—ie the creation of a new narrative horizon starting with what seem to be the vestiges of an interior catastrophe—is an appeal to hope rather than a therapeutic litany. Because what it suggests, along with the irreducibility of the past, is the possibility of another story, another body, and a different time and place. 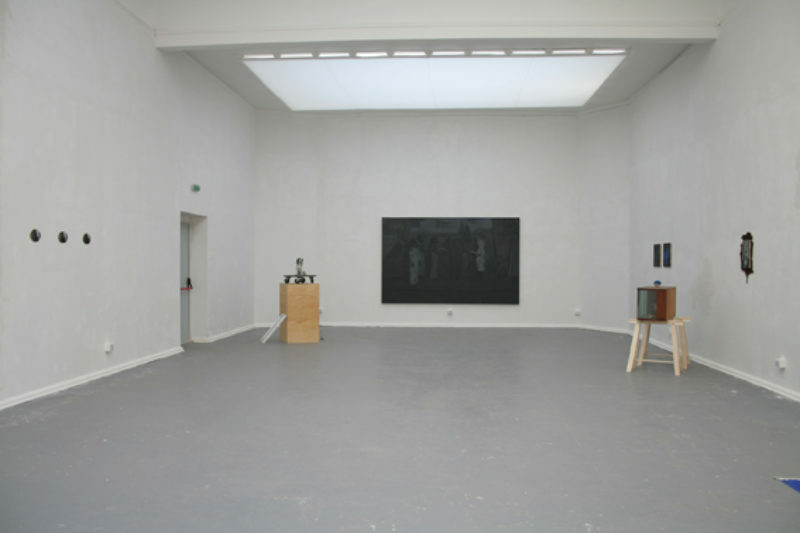 In many cases, the procedure through which the images are deprived of their original meaning and are displaced within an uncommon configuration turns to the graphic language of illustration, the gist of a sketched line and the use of silhouette, as is evident in Perfect Crime, the solo exhibition held at the Plan B Gallery in Cluj in 2005. In this case, the narration of a struggle between two men, which ends in the murder of one and his cremation to produce pigment for the painting, generates minimal illustration of the action, akin to the descriptive character of a storyboard. In such works, Man seems to want to strip painting down to its bare bones to bring it closer to the demonstrative use of verbal language, and he does this by reviving illustration, implicitly alluding not only to the world of children but also to the syntax of public signage, cartoons and the use of sketches in journalism prior to the advent of photography. In short, he draws attention to the process of symbolic reduction. For his first solo show at Galleria Zero in Milan, Man used another example of this process of symbolic reduction and the investigation of exhibition space. In this case, the fable of the fox and the crow was fragmented into a series of scattered elements. Short phrases were extrapolated from the narrative statement and strewn near the corners, Yet Man does not use memory for consolatory purposes: his is not a gentle world offering succour. His language is ostensibly laconic. 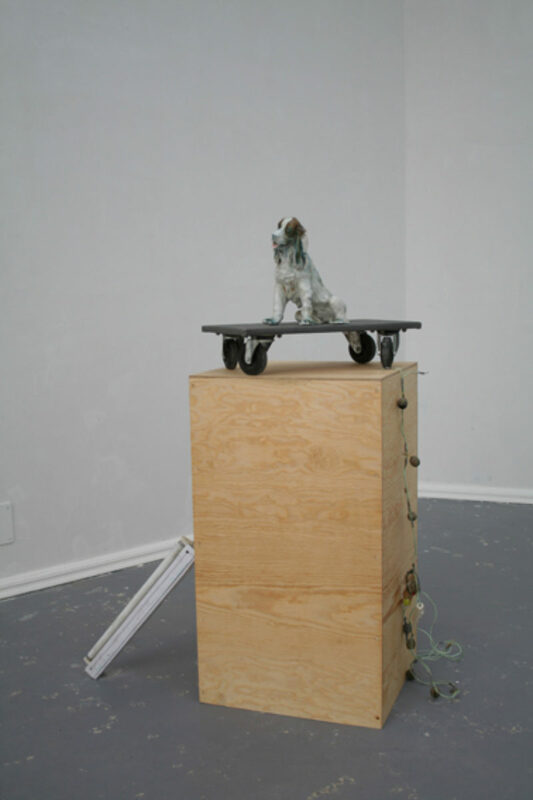 Most of his paintings are small; his sculptures are the outcome of a very simple juxtaposition of elements that have been found and, for the most part, exhibited in their entirety. A few other spurious things (photographs, sketches, texts, objects) are combined in small compositions within a space that is otherwise left empty. The images in the paintings clearly betray their mass-media origins and the fact that they pertain to an essentially unidentified elsewhere of reproducibility (books, cinema, magazines, the Internet). Nevertheless, the broader and more complex installations in which they are set muddy the waters, because the way in which they close to the ceiling or floor. Other elements of the story gave way to a series of metaphorical ‘replacements’, in which the fox became a fur tail and the crow was evoked by a heap of maize kernels. The moral and educational functions of the fable are thus absorbed by language itself and are rearticulated as metonymy, metaphor and detournement. I am convinced that these examples of the reduction and simultaneous expansion of the meaning of the images are profoundly related to Man’s avowedly intentional rejection of style in painting, which accompanies his rapport with existing images and is based on purging the specific memories they convey. This other form of reduction—this time with regard to style, through painting that is often rigid or flat or viscous—also transforms the image and, above all, its informative or seductive function. It is a transformation described by the artist as a fetishistic relationship that he finds necessary to allow ‘a certain metaphysical value to predominate over political, religious and social contents’. One cannot help but wonder what this metaphysical value is, now that art seems to use deconstruction to achieve displacement, delay, postponement, lingering within enigmas and the absence of synchronism. In Man’s work, disconnection is indeed an instrument to restore a vision of the world that, though interrupted and traumatised, is nevertheless persistent and vital. By the same token, however, the strategy of dispersion is merely a stage in the broader quest for a new and more stable territoriality. Man does not linger over loss, erratic motion or the episodic nature of information. Just the opposite; his is a slow but constant production of unity. 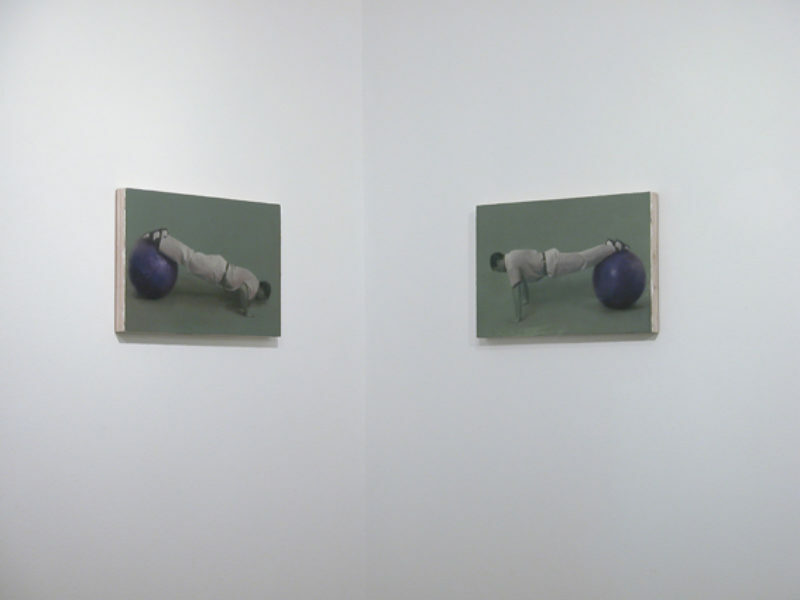 A careful look at the way that his painting is spatialised within his installations reveals a sort of ‘specific weight’ of the images, a cogent way in which they occupy space, and even the need for their dimensions.